Eighty percent of remodelers reported a shortage of finished carpenters (and 41 percent said the shortage was serious), according to special questions on NAHB’s Remodeling Market Index (RMI) survey in the 3rd quarter of 2015. That’s 8 percentage points higher than NAHB remodelers were reporting just a year ago. 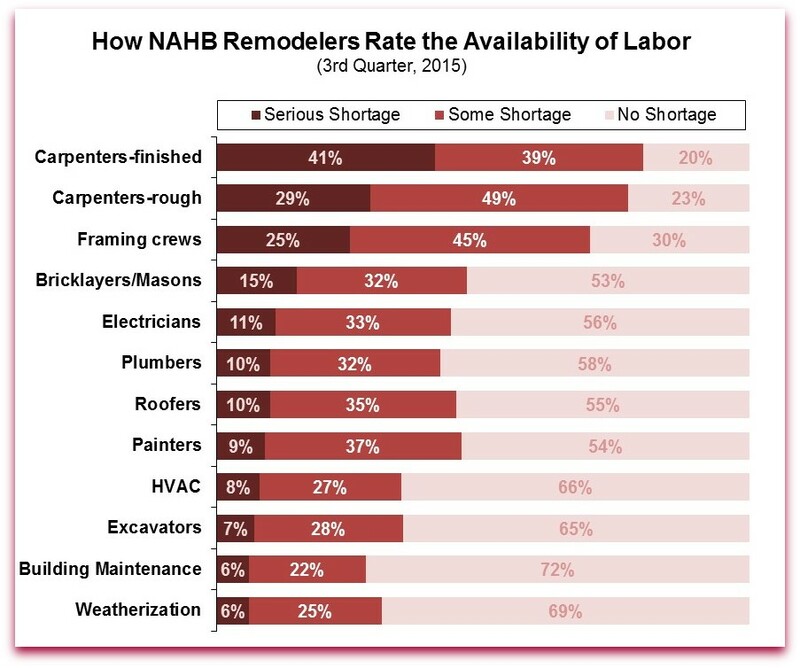 The RMI survey asked remodelers about availability of labor in the 12 categories recommended by Home Builders Institute (an organization established by NAHB to train construction workers and promote careers in the industry). After finished carpenters, shortages were most widespread for rough carpenters (reported by 78 percent of remodelers) and framing crews (70 percent). A similar survey of single-family builders in June of 2015 showed the same three carpenter categories at the top of the shortage list, although not in the same order. It’s probably not surprising that new home builders would be more likely than remodelers to notice a shortage of framing crews. 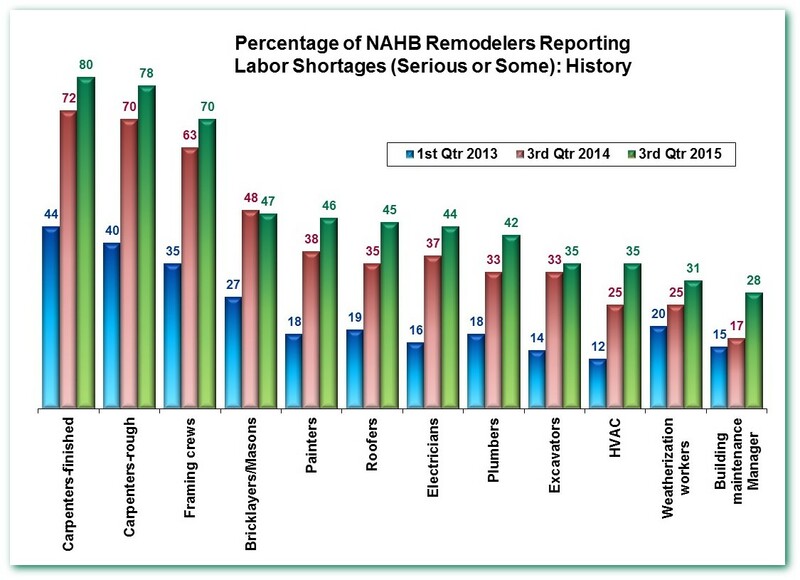 The 3rd quarter of 2015 marks the third time NAHB has asked remodelers about labor shortages. The short history shows a strong increase in the incidence of shortages since 2013. Between 2013 and 2014, the share of remodelers reporting a shortage increased in every one of the 12 trades, and in most cases the increase was large. In 2015, the shortage percentage increased further in every trade except masonry (where it remained essentially unchanged). In the one category where the shortage percentage increased only slightly in 2014—building maintenance managers—the percentage jumped sharply in 2015. So far we’ve discussed labor employed directly by remodelers. The 3rd quarter RMI survey asked separately about shortages of subcontractors. The ranking of labor and subcontractor shortages across the 12 trades was similar, but shortages of subcontractors were even more widespread. In the finished carpentry category, for example, 86 percent of remodelers reported a shortage of subcontractors, compared to the 80 percent for finished carpenters they employ directly. One possible reason for the difference is that, during the downturn, laid-off construction workers started their own subcontracting businesses, and now some of the old relationships may be re-forming. That is, owners of small businesses may now be returning to work for larger companies, slightly improving the pool of directly employed construction workers while subtracting from the number of small subcontracting firms available. Results for all 12 categories of subcontractors are contained in the full survey report, available here. Of course, availability of labor varies across the country. In the 3rd quarter of 2015 many, but not all, remodelers were reporting labor shortages. Some even wrote in explicit comments stating that, in the areas where they do business, no shortage existed. If you’re interested in strategies to address labor shortages in the remodeling industry, please join NAHB on Nov. 18 for a webinar on how to recruit and retain workers in a diverse marketplace.